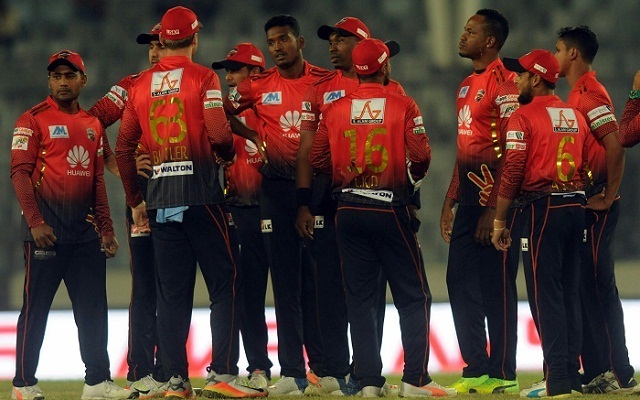 Comilla Victorians slammed Rajshahi Kings by huge nine wickets margin for their 2nd win in the 5th Bangladesh Premier League (BPL) T20 at Sher-e-Bangla National Cricket Stadium on Sunday. Chasing a target of 116 runs, Comilla shored their win scoring 120 for 1 in 15.1 overs where Jos Buttler and Imrul Kayes shared an unbeaten partnership of 97* off 13.1 overs in the 2nd wicket stand. Jos Buttler played till the end for a half century of 50* off 39 balls, including four boundaries and two sixes, while Imrul Kayes, who fired a six off Malcolm Waller in the match's last ball, added 44* off 41 balls, including four boundaries and one six. Farhad Reza bowled out opener Liton Kumar Das (23 off 12b; 2x4; 2x6) on Comilla's 23/1 in 2nd over, from where Buttler- Kayes started their unbeaten show. Farhad Reza conceded 31 runs in two overs for one wicket. Sent in to bat first, Rajshahi scored 115 for 7 in 20 overs where opener Lendl Simmons top-scored 40 off 40 off 23 balls, including six boundaries and one six, before being retired hurt at 48/2 in 5.4 overs. Simmons hammered three successive boundaries off Arafat Sunny before suffering hamstring pulls facing the 4th ball of innings 6th over taking a single run. Number 8 batsman Farhad Reza played an unbeaten innings of 25* off 30 balls with a boundary while skipper Mushfiqur Rahim (16 off 14b; 3x4) and Mohammad Sami (10* off 16b) were the other double digit scorers for the side. Delivering four overs each, Comilla's skipper Mohammad Nabi got three wickets for 15 runs while man of the match Rashid Khan bagged one wicket for economic seven runs. Al-Amin Hossain and Dwayne Bravo took one wicket each for 24 and 28 runs in three and four overs. With the day's results, Comilla collected four points from three games as they earlier lost their 1st game against Sylhet Sixers by four wickets before an emphatic eight wickets victory against Chittagong Vikings in the next game. Bottom-run Rajshahi collected two points from four encounters, suffering a six-wicket loss against Rangpur Riders in their 1st match, and then suffered another loss against the table topper Sylhet Sixers by 33 runs before upset Rangpur Riders to taste the maiden win with an emphatic eight-wicket margin before the day.